I am so blessed to be able to teach a Sunday School class. This morning I had 3 girls starting with the little girl with the pink hat her name is Sarah. 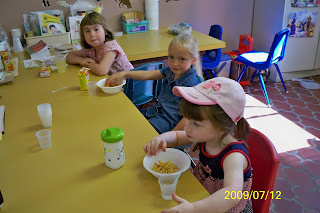 The second little girl is just new to our class and her name is Kayla. The third little girl is Maria and she is 6. She will move up to a new class in September. Mandy and Paul were unable to make it this morning. What a joy it is to be able to tell and show them how much God loves them. I remember going to Sunday School with you sometimes...I used to be so nervous because I didn't know anyone!